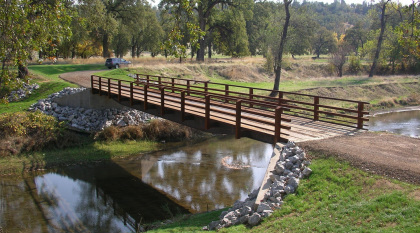 When your project involves a vehicular, pedestrian, golf course, agricultural, or heavy construction bridge; JMStructures can provide what you need to complete the job cost effectively and timely. Through our website, we want to provide you with information about us, bridges, and specific project photos. JMStructures consists of an engineering business, Morris Engineering, and a construction company, J.S. Morris Construction, Inc. Our team can provide design-build services (start to finish) for your bridge project. Morris Engineering has been designing bridges for over 20 years and has been responsible for well over 200 bridge projects providing structural design, calculations and construction review. Our specialty is in the area of small span bridges of 20-140 feet using steel beam, steel truss, precast concrete, cast-in-place concrete, or railcar girders. Our repeat clients particularly value the professional quality and personal attention we give to each project. Our business is located in Ukiah, California. J.S. Morris Construction, Inc. provides general engineering construction services for our clients. With years of extensive experience in building bridges, we can provide foundation construction services from the ground on up; or should we say, from underground on up. 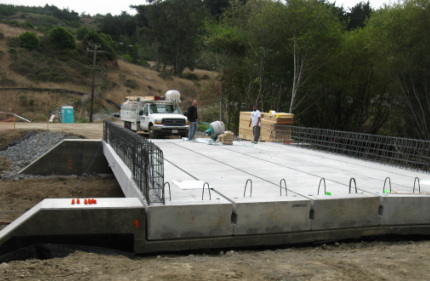 We have been involved in a variety of bridge construction projects utilizing foundations of cast-in-place piles, driven steel piles, driven concrete piles, sheet piles, concrete tie-back piles, steel bents and abutments, concrete wingwalls, and concrete spread footings. Our clients appreciate the construction services we provide because we strive to find solutions that are site specific, economical, and completed in a timely manner. Our website goal is to provide you with information about our engineering design and general engineering construction services, and various bridge options to help you understand and make an informative decision about your specific bridge project. If you are not familiar with JMStructures: Morris Engineering and/or J.S. Morris Construction, Inc., and your first contact with us is online; we would be pleased to hear from you! Please let us know if you have any specific questions, and we will be more than happy to help. If you find you have further questions after reviewing our website, you can reach us under "Contacts" of this website or by phone at (707) 472-0504 or by email at morbridges@saber.net. We look forward to hearing from you.